Image retrieved on Flickr.com on September 23rd, 2013. Datura Stramonium is a common weed, related to the more widely known deadly nightshade. 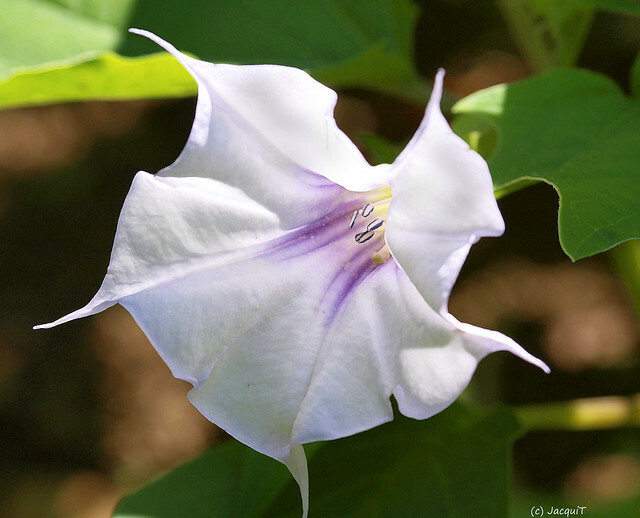 Like many potent plants it has accumulated a plethora of wild and wonderful names, including angel's trumpet, mad apple, stink weed, Devil's trumpets, thorn apple, hell's bells, and jimsonweed. In fact, the latter derives from the most famous incident of Datura poisoning, when British soldiers sent to Jamestown in Virginia in 1676, to suppress an uprising known as Bacon's Rebellion, were poisoned en masse with the plant - sources disagree whether this was by wily colonists or by accident. "Some of the soldiers sent thither to quell the rebellion of Bacon...ate plentifully of it, the effect of which was a very pleasant comedy, for they turned natural fools upon it for several days: one would blow up a feather in the air; another would dart straws at it with much fury, and another, stark naked, was sitting up in a corner like a monkey, grinning and making (faces) at them; a fourth would fondly kiss and paw his companions, and sneer in their faces with a countenance more antic than any in a Dutch droll. "In this frantic condition they were confined, lest they should, in their folly, destroy themselves - though it was observed that all their actions were full of innocence and good nature. Indeed, they were not very cleanly; for they would have wallowed in their own excrements, if they had not been prevented. A thousand such simple tricks they played, and after 11 days returned themselves again, not remembering anything that had passed."